A source has confirmed to the Bobcats Hockey Blog that Team Maryland forward Connor Tait has verbally committed to Quinnipiac University for either the 2019 or 2020 season. The 6'1, 190 pound power forward out of Boyd, Maryland is a January 2001 born player. The Bobcats have had previous success from another Team Maryland player in Sam Anas ('16) who was one of the most prolific players in the Quinnipiac's history and signed a professional contract with the Minnesota Wild and is currently playing for the Wild's AHL team in Iowa. Tait has so far shown the ability to score at a young age. 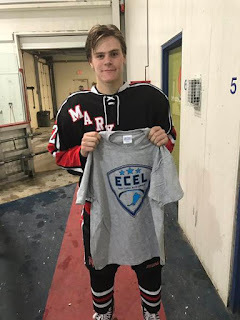 In 29 games played for Team Maryland split between the AYHL 16U and ECEL 16U he has scored 42 goals and has 14 assists. In the ECEL playoffs he had another goal and four assists in four playoffs games. On top of playing for Team Maryland, Tait is also a sophomore standout on the Gonzaga College High School team in Washington, D.C. In 24 games played for Gonzaga, Tait has scored 30 goals and has 14 assists. That leads the team in scoring by 13 points over the next highest player on the roster. Here are a couple of scouting tidbits from Neutral Zone and Matt Grainda an amateur scout for the USHL. Back in 2015 U.S. Hockey Report wrote this scouting report on Tait after seeing him at a tournament. 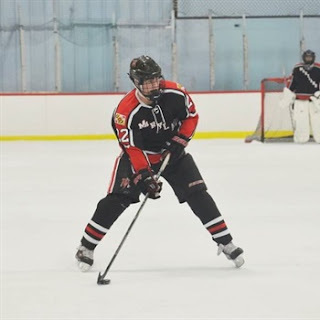 "Connor Tait, ’01 F, 6-0/175, #22 Team Maryland – Big right-shot power forward was physical and not afraid to use his size. A center, he has a good quick release to his shot, with no telegraphing. Went wide on defenders down the right side at will, using his long reach and strength to hold off defenders. Protects it very well. And sees ice well. Has a powerful stride and quick acceleration though he’s not very agile, just like many big kids his age." Last July, Tait was selected and took part in the USA Hockey Select 15 Player Development Camp in Amherst, NY which is comprised of the top 15 year old players throughout the United States. USHR rated Tait an A forward at the camp and had this to say about him. Just recently Tait was selected in the first ever NCDC draft by the New Jersey Hitmen which is the USPHL's tuition-free division that will drop its inaugural puck in September 2017. Tait is also eligible for the USHL draft and the OHL draft this spring and is NHL draft eligible in 2019. Tait becomes the fifth 2001 to commit to Quinnipiac after Ethan Phillips, Dom Fensore, Nicholas Kent and PJ Fletcher. Congrats to Connor and his family on this great achievement.